One of the wonderful metrics of my journey across the country has been the different historical trails that each region has been proud of. Across the open desert of the west it was the Pony Express trail; in the mountains of Colorado it was the Continental Divide; in the rolling hills of Illinois, Indiania, and Kentucky it was Abraham Lincoln’s westward migration towards Springfield, and near the Ohio River where I would finally cross into Kentucky, it was Lewis & Clark’s famous trail. I stopped in the aptly-named Clarksville, Indiana, the oldest American town in the Northwest Territory and the home of George Rogers Clark. It was in George Rogers’ small cabin that his younger brother William and Meriweather Lewis did their final gear packing and launched out on their own cross-country journey 2006 years before me, and with much less Goretex. Before crossing the river I stopped at the Falls of the Ohio National Monument, a lovely flood plain on the banks of the Ohio where exposed fossil beds sun themselves just above the waterline, but I couldn’t stop for long since I was bound for civilization a bridge away. Louisville apparently has a dedicated nightlife district, the two-block long “4th Street Live!” which, with cab-only driving and (possibly?) open alcohol allowed the city is seemingly trying to build into a music, tourist and party destination along the lines of 6th Street in Austin. I was looking forward to a relaxed and welcoming evening in Kentucky, so the drunk lines at the Hard Rock Cafe didn’t tempt me, and I continued past the loud hordes to my friend Yelp’s favorite spot at the bar of the Old Seelbach hotel. Oh, the delicious taste of Kentucky! With 61 bourbons on the menu and me planted firmly at the modestly-lit brass and walnut bar, I felt as much like a true American as at any time this stummer. Our nation’s official spirit will now always be my spirit of sore muscles and happiness. The next morning I made my way to the south of the city where I was just in time for the Kentucky State Fair. This had actually been reccommended to me in St. Louis, and I was anxious to see what they had to offer. To my slight embarrasment and chagrin as a born and bred Wisconsonite, I’d never been to an actual state fair, so this was also my chance to finally innagurate myself into that part of my corn-n-cows herritage. I spent about half the day wandering through parking lot of the fair grounds among the food stalls and music tents. 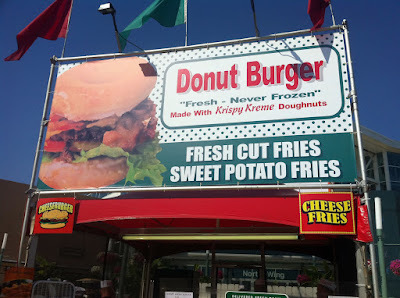 I was vaguely aware that state fairs are the avante guard of the current revolution in fried foods (namely, discovering that *anything* — from butter to coke — can be fried), but I was still wowed by the number of booths willing to dunk any food I wanted into boilng oil. My favorite offering, I think, was the was the Krispy Kreme burger with bacon and cheese. Inside the large exhibition halls I found many a Rand Paul sign and a few Tea Party buttons attached to baby stollers being pushed around the vendors’ hall, but much of the feel was agricultural. There was an entire building devoted to competitive cow ownership, but my favorite section was the tobacco competition. This is what the 4H club does here. Does Philip Morris know that you’re winning prize money from their product? After both bourbon and corndogs I *still* had extra days of rest to use, so I took advantage of being in this part of the country. One of the driving goals of my trip is to spend time in the parts of my country that I otherwise don’t have reason to, and this is one of those places; thusly, I decided to rent a car and visit friends in Nashville (which sadly fell through) and Memphis. This required a little back-tracking, but my friend Jess was kind enough to drive up from her home in Mississippi and meet me half way, so it seemed as good a plan as any. This was my second time in Memphis, so having already conquered Beale Street and Graceland on a guys’ road trip in 2007, Jess and I decided to spend our 24 hours more historically. We listened through a very enjoyable tour of Sun Records (thanks for Carl Perkins, Roy Orbison, and Johnny Cash, and Elvis! ), took in the fun video and less-thrilling historical exhibit at Stax Records (I mostly remember Isaac Hayes), and were blown away by the National Civil Rights Museum. This last was surprisingly powerful; built around and into the Lorraine Motel where M. L. King was shot, the museum gives a surprisingly thorough history of the civil rights movement until his death, like a well-kept college notebook on the subject transformed into an exhibition.